Oh man. the tail end of Me Made Made was made extra special with a week-long head cold. Oh, and end of school year craziness. Hence this post being a week late ¯\_(ツ)_/¯. 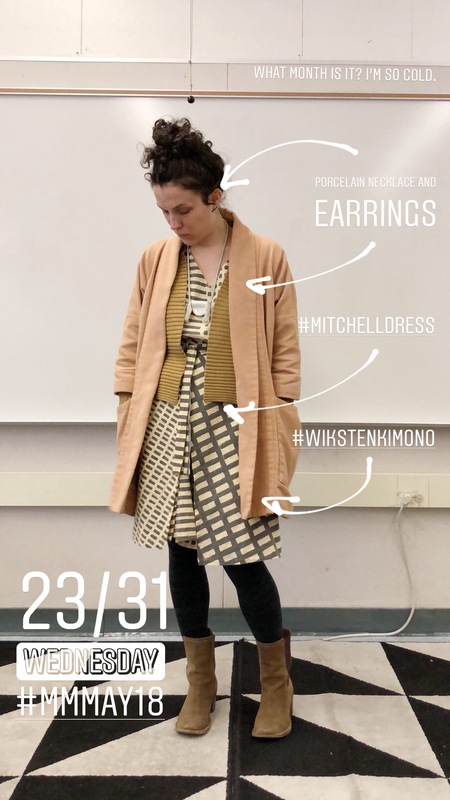 Me Mades: Mitchell Dress, porcelain necklace and earrings, Wiksten Oversized Kimono Jacket. Other: Thrifted Frye boots, thrifted sweater because it’s cold. Me Mades: Woven Hudson Pants, Shirt No. 1, WAK Classic Sweater. Other: Vans, Shape Shape Shape Shape necklace. Day 25 – A New Garment! 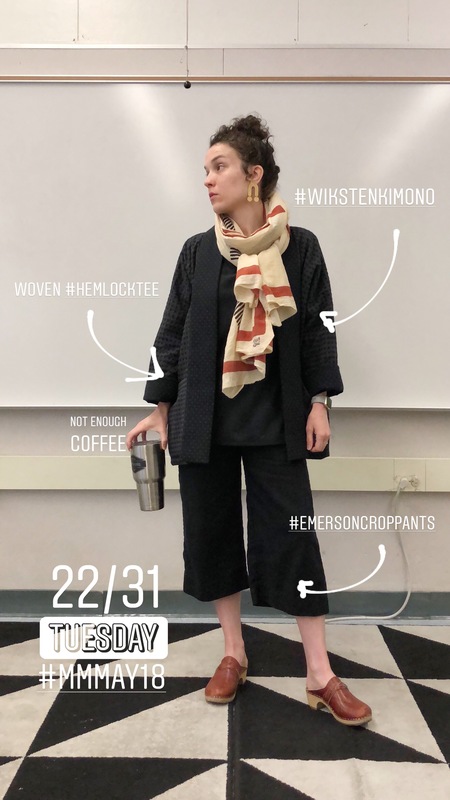 Me Mades: Hacked Wiksten Kimono, Emerson Crop Pants, silk noil Willow Tank. Other: Dansko boots, vintage necklace. 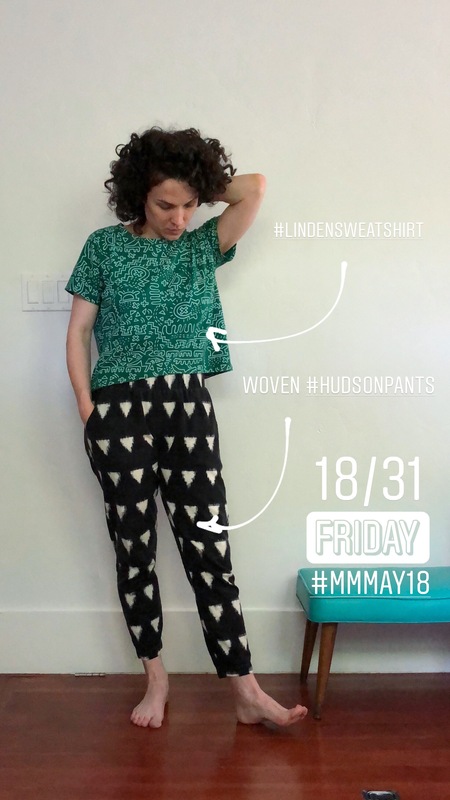 Me Mades: Woven Hudson Pants, silk noil Hemlock Tee. Other: Vans, Block Shop Scarf. 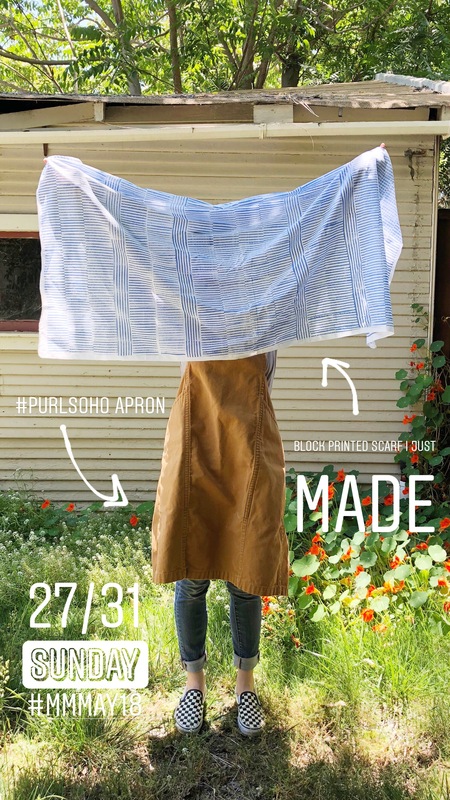 Me Mades: Hand Block Printed Scarf, Purl Soho apron. Other: Vans, thrifted jeans, thrifted t-shirt. I was working with dye today and didn’t want to risk getting in on any me-mades. The rest of the day was spent on the couch nursing a cold. Day 28 – I FEEL TERRIBLE. 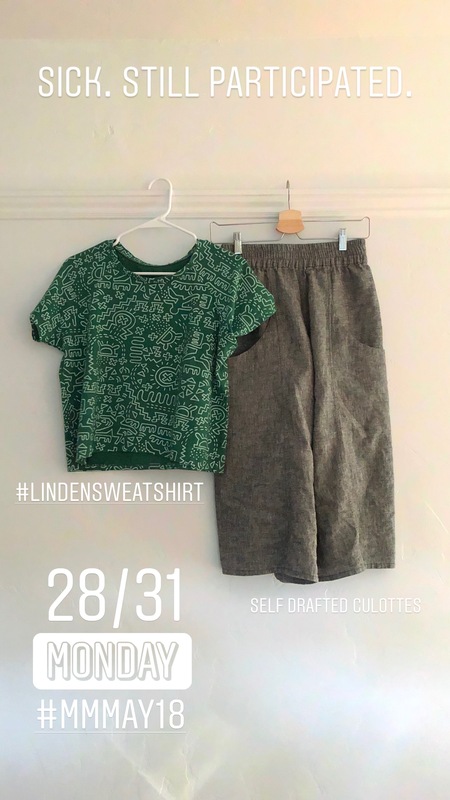 Me Mades: Linden Sweatshirt, self drafted culottes. Other: Lots of Kleenex (not pictured). Me Mades: Dress No. 1 with inseam pockets. Other: Vans, thrifted t-shirt, sickness. Day 30 – still BLAH. 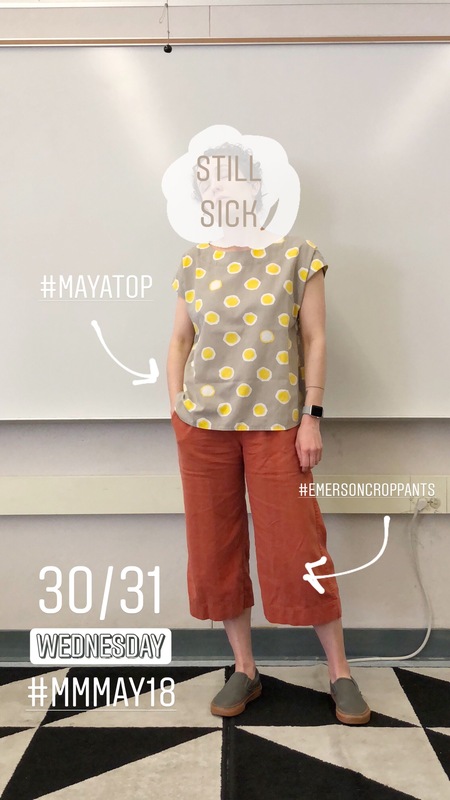 Me Mades: Maya Top, Emerson Crop Pants. Day 31 – Starting to feel better but then stayed up too late and made it all terrible again. 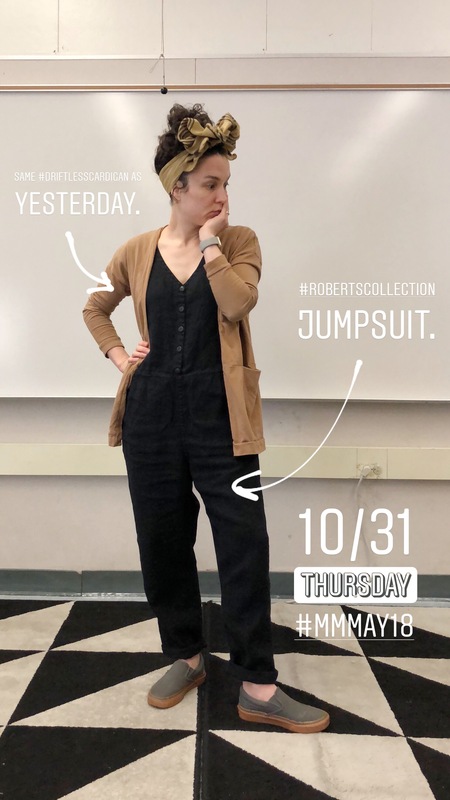 Me Mades: Roberts Collection Jumpsuit. Before May stated, I could already identify the gaping holes in my Me Made wardrobe. I was hoping that the challenge of wearing only me-made garments would light a fire and get those holes at least partially filled in by the end of the month. After all, I made so much during May 2017. None of that happened. My productivity was pretty low and I’m trying not to beat myself up about it. Outerwear – It was fricking cold in the Bay Area (okay, cold for CA) this month and I was forced to cheat a few times because of that. 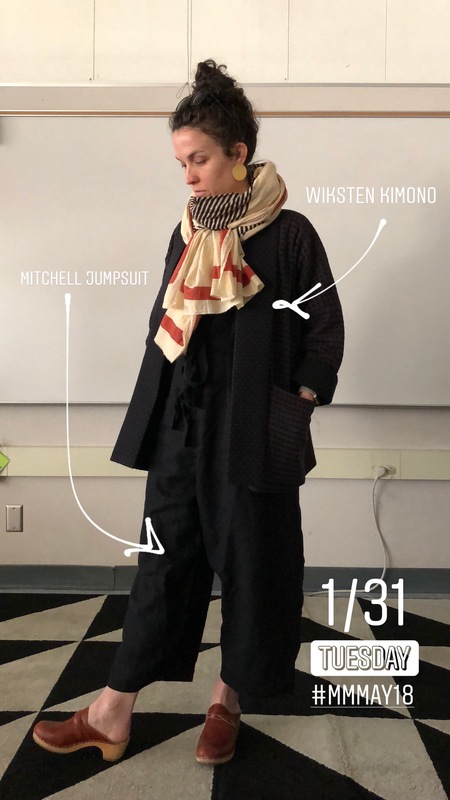 My current outerwear selection is mainly oversized kimonos and one Kelly Anorak, which I found didn’t pair well with the loose fitting silhouette of most of my me-made bottoms. It was just too much volume all together. I intend to make the Grainline Tamarack and the Hampton Jean Jacket to remedy this situation. Jeans – Holy crap did I miss fitted pants. I really need to just go for it. Planning to make Ginger Jeans, Persephone pants, Landers, and Morgans (but with high waisted mom jean goodness). Day 13 – I need more me-made loungewear. I’ve been really wanting to make a robe for weekend mornings, which I think will be my first loungewear make (before a lot of Hudsons). 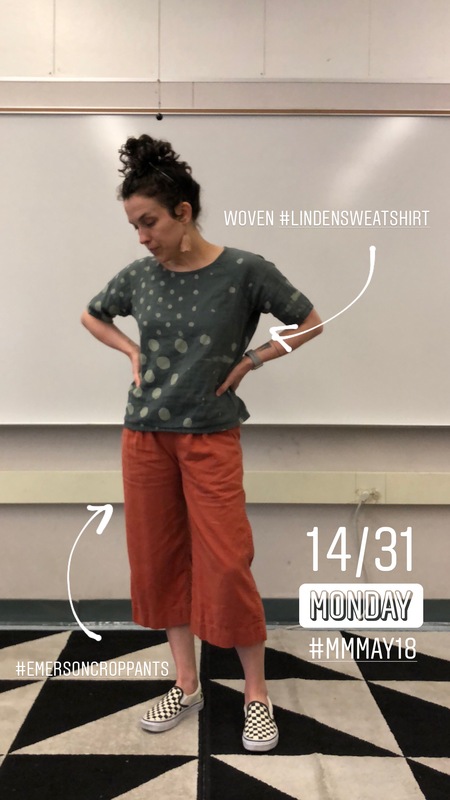 Me Mades: Emerson Crop Pants, Linden Sweatshirt (this poor thing is falling apart due to a serger fail I didn’t notice until the end). 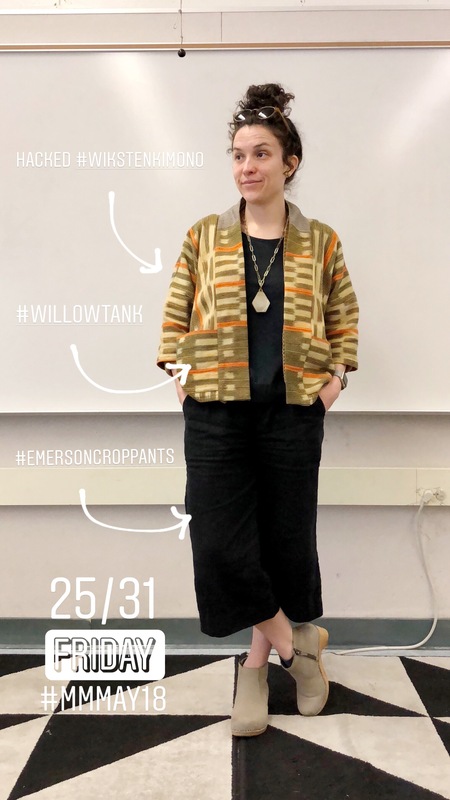 Me Mades: Emerson Crop Pants, woven Linden Sweatshirt. Day 15 – CHEATER. 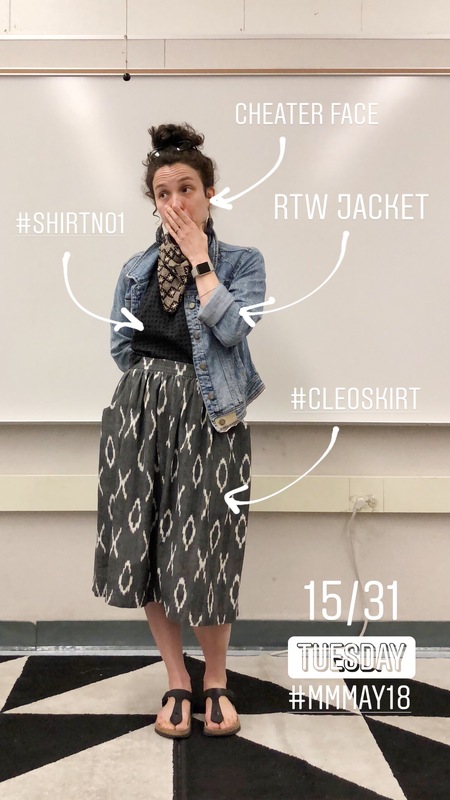 I cheated and wore a RTW item. 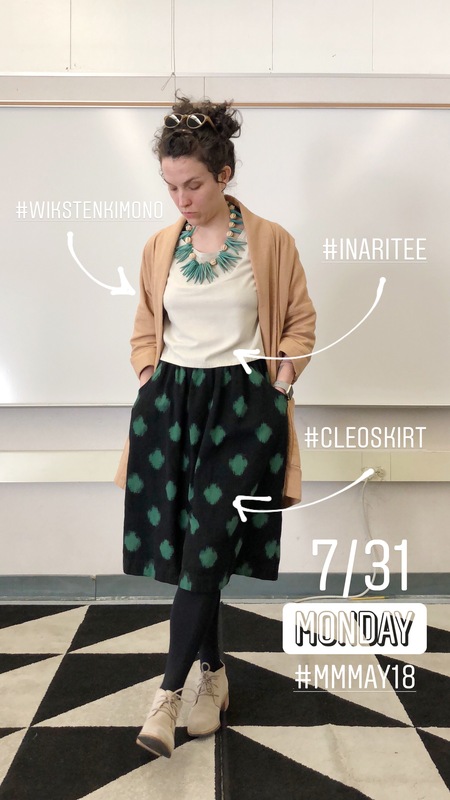 Me Mades: Cleo Skirt, Shirt No. 1. Other: Thrifted Pilcro jean jacket, Birkenstock sandals, Fibrous earrings, Blockshop scarf. Day 16 – I’d like for it to be summer. 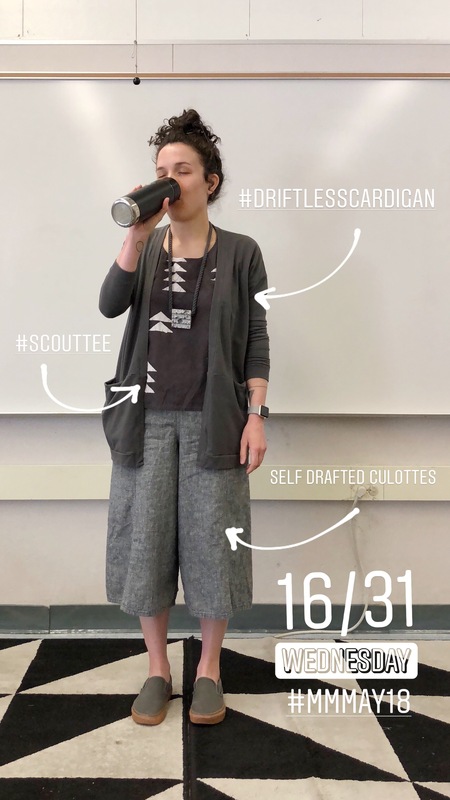 Me Mades: Self drafted culottes, Scout Tee, Driftless Cardigan. Day 13 – Very Voluminous. This was not a good outfit. 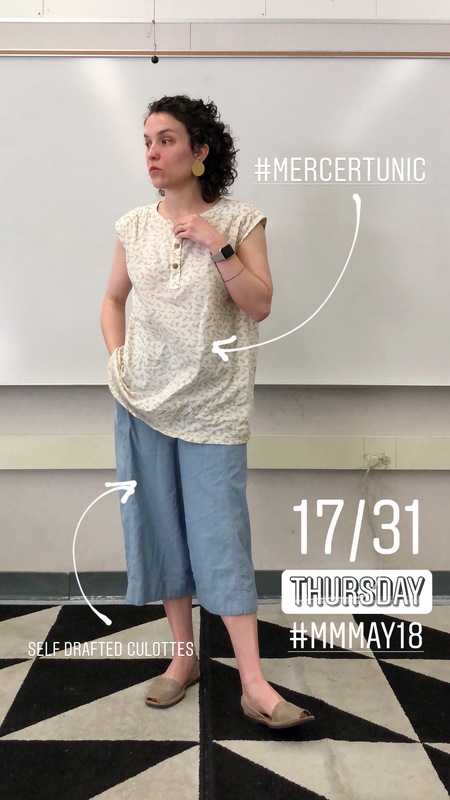 The Mercer pairs better with skinny pants (which I have yet to make) and the culottes pair better with a tight knit top tucked in (also need to make), or a cropped woven shirt. You gotta balance out the bulk. Me Mades: Self drafted culottes, Mercer Tunic. Other: Avarca sandals, Baleen earrings. Day 18 – Day OFFFFFFF. 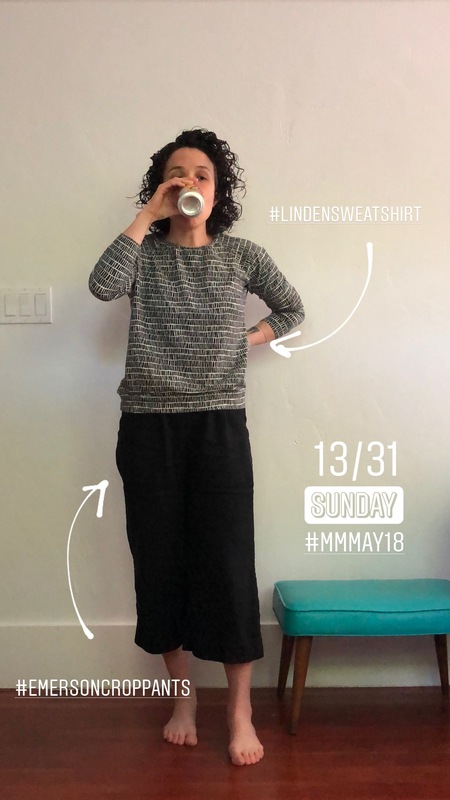 Me Mades: Linden Sweatshirt, woven Hudson Pants. Other: none. Because I was home. All dayyyyy. 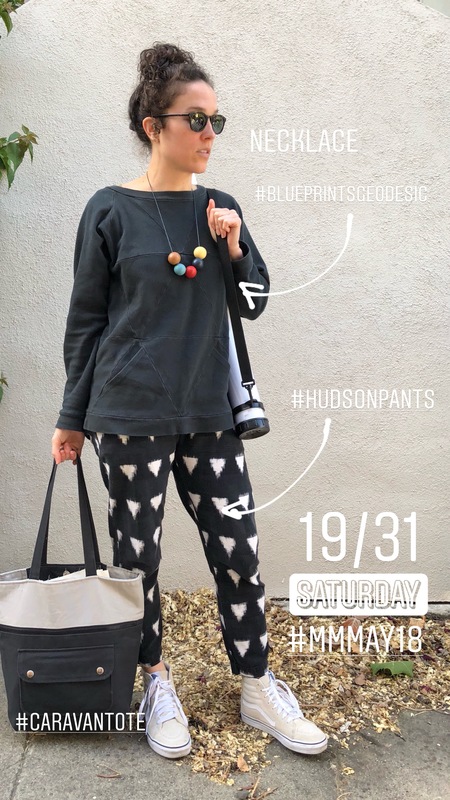 Me Mades: Geodesic Sweatshirt, woven Hudson Pants, silly necklace, Caravan Tote. Day 20 – I need to get my serger fixed to make more knit things. 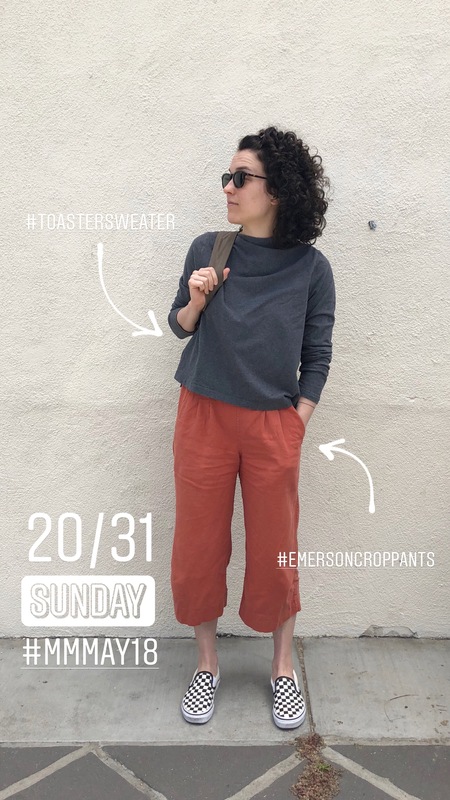 Me Mades: Toaster Sweater, Emerson Crop Pants. Me Mades: Inari Tee Dress. 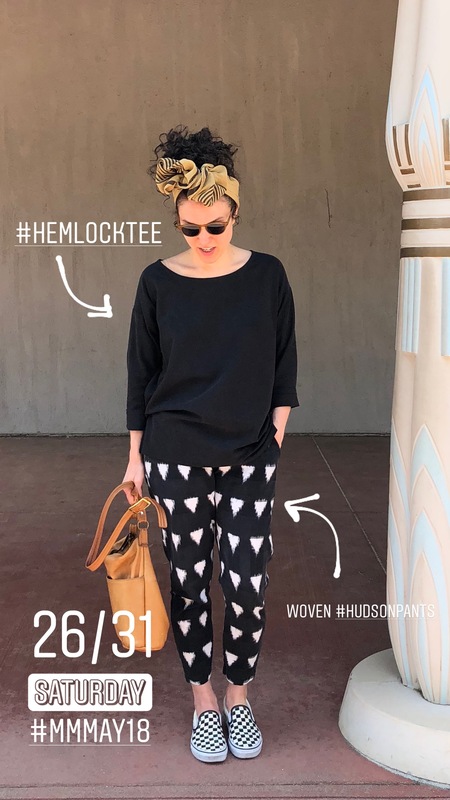 Me Mades: Wiksten Kimono, Emerson Crop Pants, woven Hemlock Tee. Other: Blockshop scarf, Baleen earrings, thrifted clogs. INSIGHTS: I definitely hit a wall in week 3. The challenge of wearing only me-made garments felt like a chore and some weird outfits came out of it (*shudder* Day 17)… And I cheated. I wore a RTW jacket. It’s been unseasonably chilly and I only have two Wiksten Kimonos and a Kelly Anorak as outerwear (which I’ve discovered doesn’t work with most of my me-mades). I need to make the Hampton Jean Jacket and Tamarack Jacket. 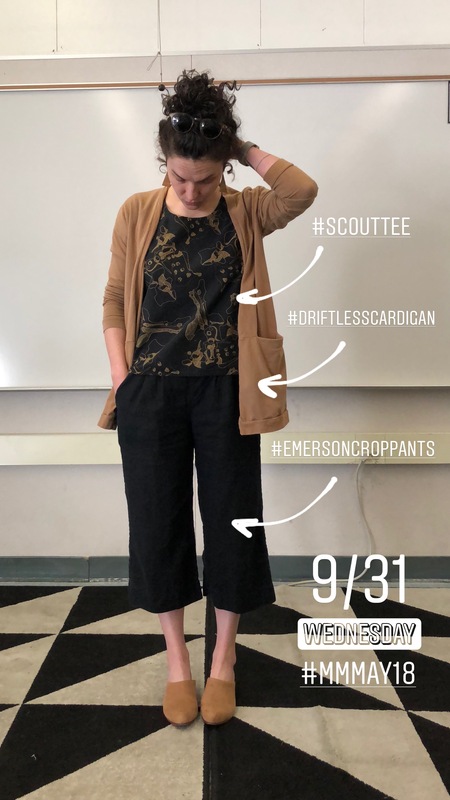 Another contributor to the Week 3 struggle was my sewing fail with the Persephone Pants. I made a straight size 4, which matches perfectly with my measurements, but are HUGE. I’m not sure if it’s a crotch curve thing or a fabric thing, but either way they don’t fit. Once I put them on and realized they weren’t going to work, I wadded them up and they’ve been on the floor ever since. I wasn’t immediately good at making them and that feeling just affirmed all of my fears of making fitted, non-elastic waist pants. Totally irrational. I’m taking some space from them before trying to overcome this setback. My serger is also having lots of tension issues I can’t seem to resolve, putting all the knit tops I want to make on the back burner (and making me dream of this beauty). BUT last night I finished the first garment this month! I put the bias finish on the neck of a silk noil Hemlock Tee I sewed up last month. Here’s to a better week! Day 7 – Ugh, Monday. Me Mades: Cleo Skirt, Inari Tee I made for my wedding, Wiksten Kimono. Other: Clarks shoes, thrifted necklace, Warby Parker sunglasses, tights from somewhere. 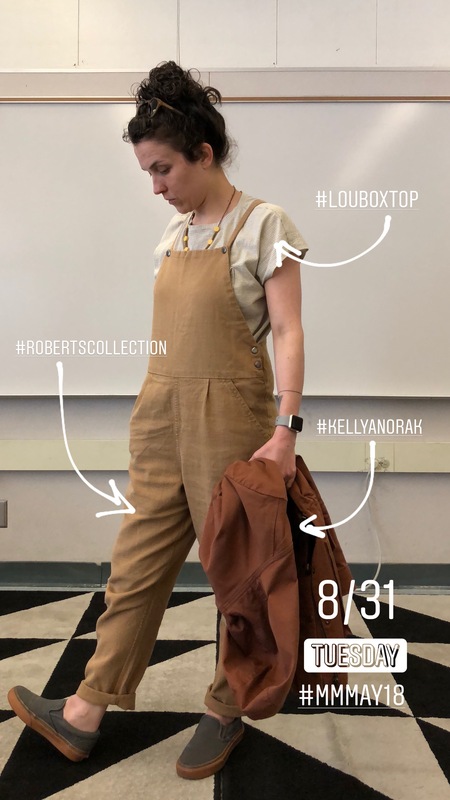 Me Mades: Roberts Collection Dungarees, Kelly Anorak, Lou Box Top. I have a hard time feeling comfortable in these dungarees if the shirt underneath isn’t super tight. I need to make some form fitting knit tops. Me Mades: Emerson Crop Pants, Scout Tee, Driftless Cardigan. Me Mades: Driftless Cardigan, Roberts Collection Jumpsuit. Day 11 – Wish I had jeans. Me Mades: Shirt No. 1, self drafted wedding skirt, Wiksten Kimono. Other: Kork-Ease sandals, Fanny Penny necklace. Me Mades: Timber Quilt, Farrow Dress. Other: Baleen Earrings, wedges I bought on Instagram, Thief & Bandit leggings. INSIGHTS – This week I really started to feel challenged and miss my RTWs, but two really good combos came out of it. 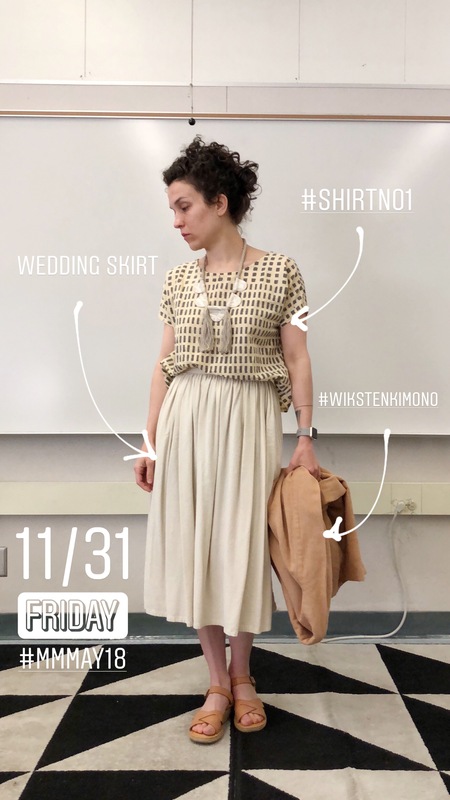 I felt super comfortable, yet put together on Day 9 and although my wedding skirt was a wee bit too tight, the colors and textures of Day 11 were just yummy. I’m not having the same jump in productivity as last year, but I think that can be attributed to a few things. My drawing practice is taking up more of my free time, this time last year I wasn’t enrolled in my Patternmaking class, work isn’t killing my soul like it did last year (I am 100% ready for summer break though), and I’m not doing a monthly make challenge. I have two Kalle shirts cut out and I NEED Persephone pants in my life. Hoping inspiration will hit and those will be on my body before the end of May. How’s MMMay18 going for you? I partook in Me Made May last year, but didn’t really know all that much about it. Thanks to last week’s LOVE TO SEW podcast, I learned more about its purpose and (self-imposed) parameters. My main takeaways from the episode are that it’s not a photo-a-day challenge, it should help you pinpoint holes in your me-made wardrobe, and that’s it’s meant to be challenging. Oh, and it’s an opportunity to celebrate your makes. 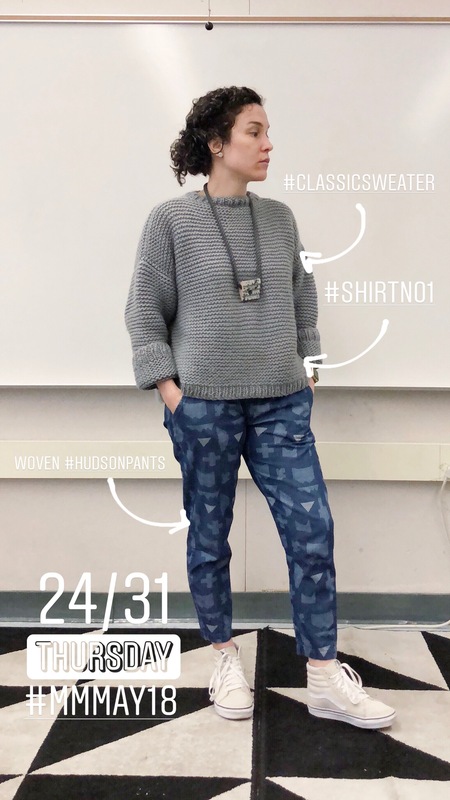 This go around I really do feel challenged – I’m wearing me-made tops and bottoms for 31 days, excluding most undergarments, cycling gear, shoes/socks, and most accessories. I don’t ever plan to have a fully me-made closet. I like supporting ethical fashion brands (evidenced by all those Blockshop scarves) and I like the quirkiness of thrifted garments. Also, knitting is hard and I get chilly. 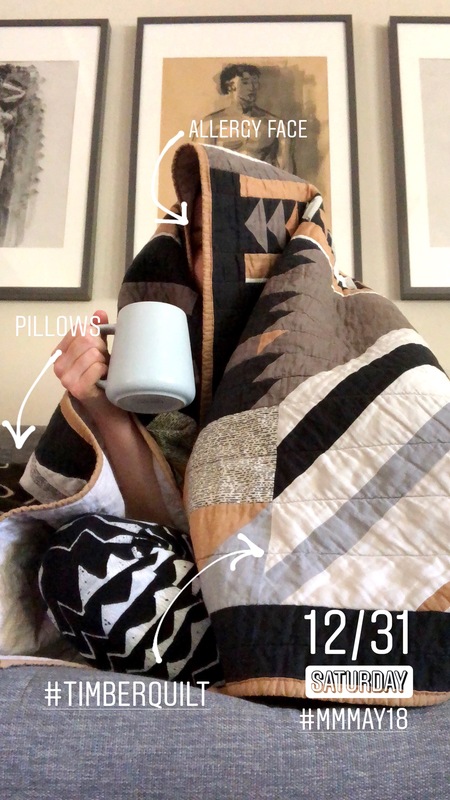 Although it’s not a photo challenge, I’m documenting each day in my IG Stories and plan to do weekly wrap ups here on the blog. Me Mades: Paddleboat Studio‘s Mitchel Jumpsuit Wiksten Kimono (soon-to-be-released). Both pieces I had the pleasure of pattern testing! Other: Thrifted clogs, Blockshop scarf, Baleen Earrings. 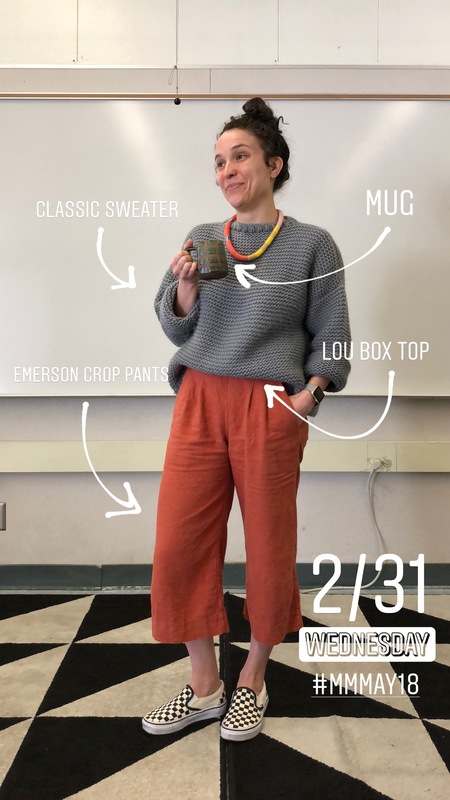 Me Mades: WAK Classic Sweater, hidden knit Lou Box Top, Emerson Crop Pants, ceramic mug. Other: Vans, Hands & Curls necklace. 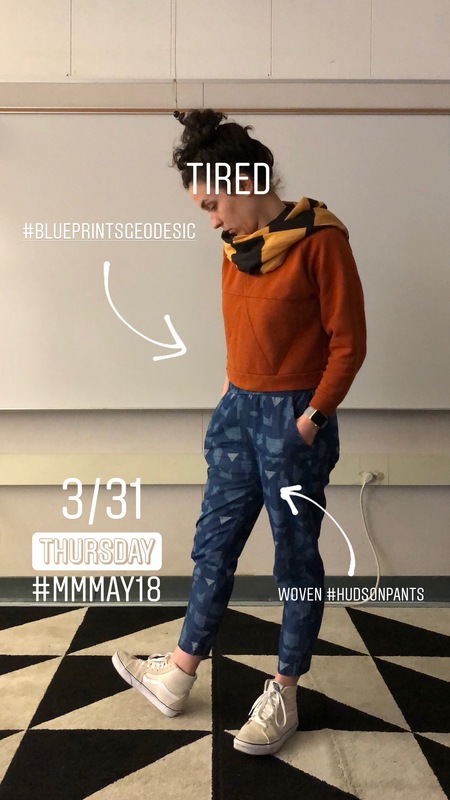 Me Mades: woven Hudson Pants, Geodesic Crop Sweatshirt made from a thrifted mens XL sweatshirt. Day 4 – I’m not mad I don’t have me-made jeans for Friday (she lies). 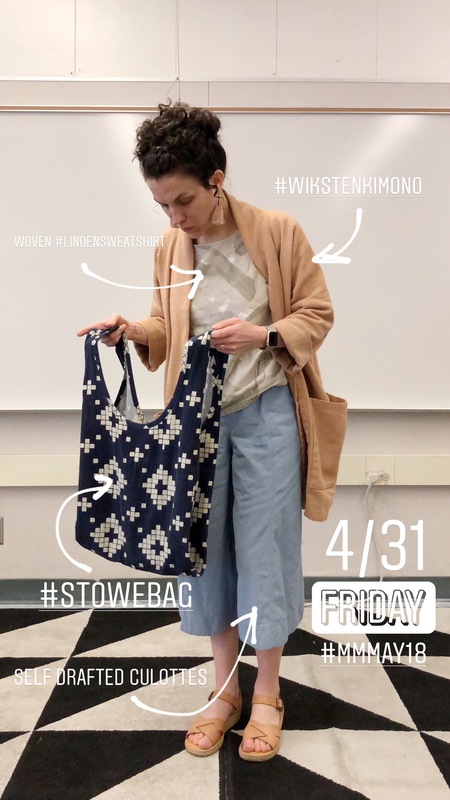 Me Mades: Stowe Bag I use as a lunch bag, Self-drafted culottes for my patternmaking class, woven Grainline Linden, Wiksten Oversized Kimono. Other: Fibrous earrings, thrifted Kork-Ease sandals. Me Mades: woven Hudsons, Shirt No. 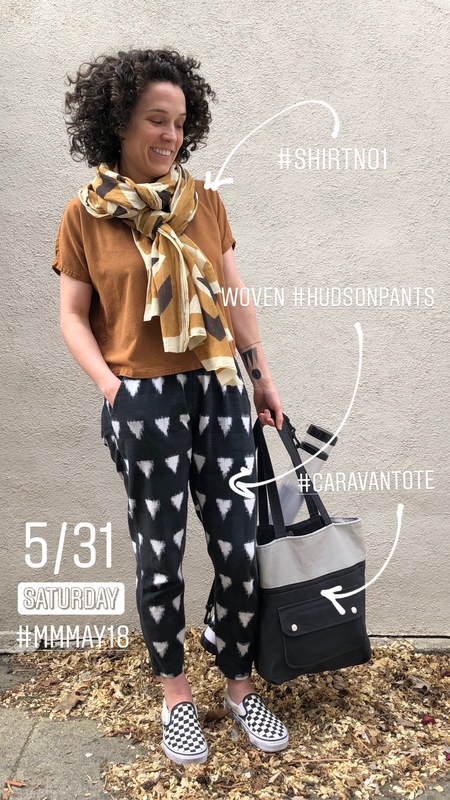 1, Caravan Tote. 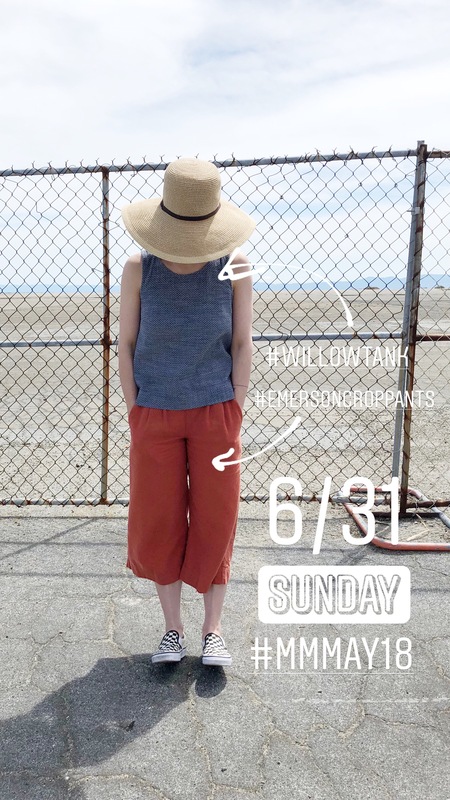 Me Mades: Same Emerson Crop Pants from Day 2, Willow Tank. INSIGHTS – Boy do I miss fitted pants and knit t-shirts. I knew these garment types were huge holes in my me-mades, but dang. It’s also been unseasonable chilly here in the Bay Area meaning I need more outwear/layering pieces. I’ve wanted to make the Hampton Jean Jacket since its release (I have all the things for it too) and a Tamarack Jacket, though I haven’t had a truly inspired fabric choice for it yet. 2017 was the first year I was able to fully participate in Me Made May. 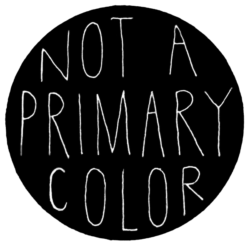 My definition of “fully participate” was to wear at least one me-made garment each day. 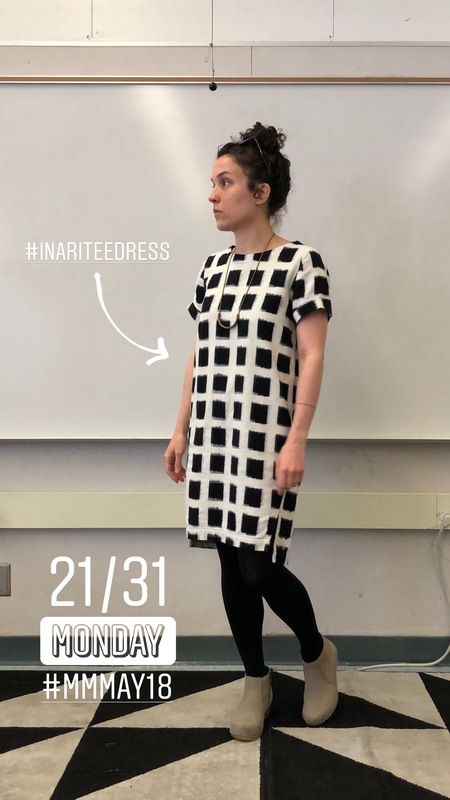 At that point, I’d only been sewing for two years and some change, so it felt pretty incredible to be able to wear at least one handmade garment for 31 days with a moderate amount of repetition. Looking back, participating really upped my productivity. 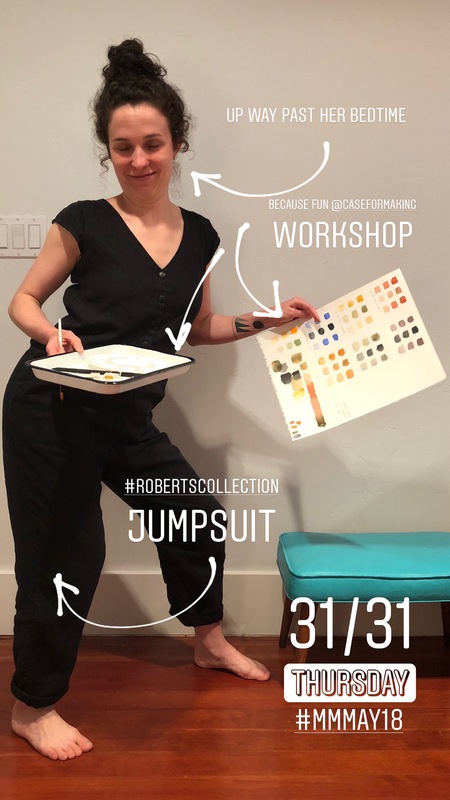 I made quite a few new garments that month like the Roberts Collection Dungarees, the Mitchell Dress, two Lou Box Tops, Emerson Crop Pants, Moji Pants, AND I finished the Kelly Anorak. Although, Me Made May wasn’t the only reason my productivity skyrocketed… I’m a teacher. May is tough. Sewing is therapy. 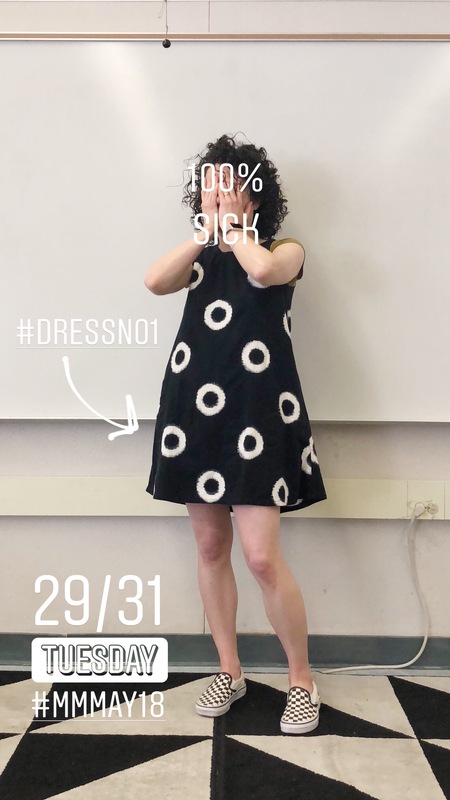 I posted my outfits in my Instagram stories because I knew I wouldn’t be able to get well lit photos each day due to my job and lengthy commute. I plan to participate in my stories again this year. Are you participating?